It is the desire of the Archdiocese of Indianapolis that all parishes be able to have a Web site that gives Internet users a chance to learn a little bit about their church, Mass times, events and other items, while at the same time providing contact information. It is the policy of the archdiocese to allow parishes to create their own Web sites and host them wherever they wish. This means that the archdiocese does not have a formal system for designing, maintaining and hosting Web sites for parishes who have no other means of getting one. Each and every one of our 147 parishes has it's own page on our parish listings. Parishes without a Web site may always refer people to www.archindy.org/parishes to get to those listings, or browse to their specific page and give out that address. Our newest feature is a Web site template that parishes can use to create a single page Web site. The design is based very loosely on this site, and gives parishes the freedom to choose one of three color schemes, include a church photo, provide contact information and list their Mass schedules. Parish staff may also include as little or as much other information as they see fit. Done this way, the cost to the parish can be as little as $0 (with free hosting and what is called a "subdomain") or in the $10-20 per month range for a real domain name and paid hosting. It's up to you! So how do you get started? Right click on the link provided below and choose "Save target as...". The file is a zipped folder that contains all the files you need, and all in the right place. 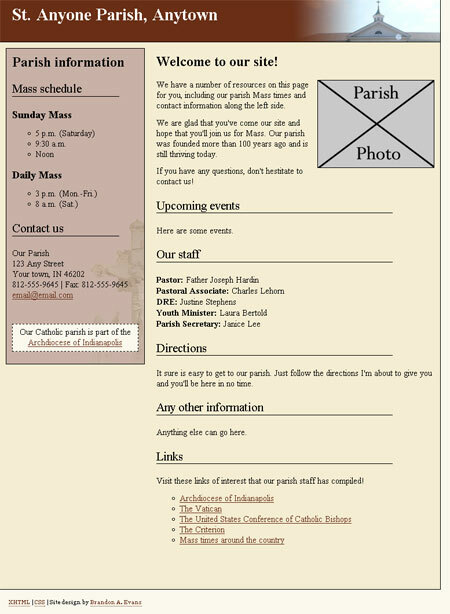 Download it and unzip (or copy) the "parish-website" folder to your desktop. Open it up and read the "Web site instructions" text file to be on your way.